ALL TOO HARD (AUS) (Bay 2009-Stud 2013). 7 wins-3 at 2, ATC All Aged S., Gr.1. Half-brother to SW Black Caviar. Sire of 231 rnrs, 142 wnrs, inc. SW Villermont (MRC Sandown Guineas, Gr.2), Tarka, Demonetization, Frosted Gold, Unfair Dismissal, All Too Huiying, Curdled, SP Cristal Eyes, Outrageous, Hardly Surprising, Roy's Riviera, Illuminaire, Eclair Sunshine, Fine Scent, Waimea Bay, Warranty, Za Zi Ba, Fling, Mystic Empire, etc. Rampaging - Ready to Celebrate (H.K.) (g. by More Than Ready). Winner at 2, ATC Super Saver 2YO P., 2d ATC Canterbury BMW 6 Series Grand Coupe H., HKJC Yik Yam H., 3d ATC Inglis Australian Easter Yearling 2YO P.
My Cherry (f. by Medaglia d'Oro). Winner at 1400m in 2017-18 in Aust. Foxy's Joy (f. by Foxwedge). Winner at 1200m in Aust. Coffee Hit (f. by Medaglia d'Oro). Winner at 1400m in Aust. Lady Vuvuzela (f. by Hussonet). Winner at 1400m in Aust. Girls Own. 9 wins from 1000m to 1600m, A$121,215, to 2017-18 in Aust. Fountain Joy. Winner. See above. Questionheir. Winner at 1100m, 3d BTC Tenterfield Saddler 3YO H.
Charleise (Foxwedge). 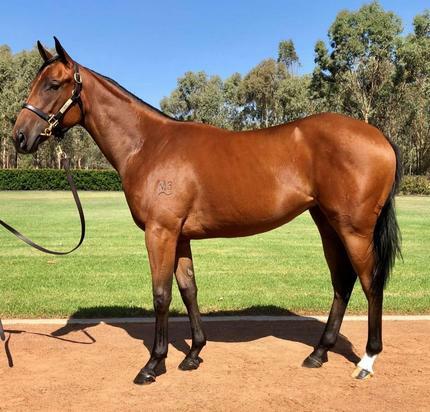 Placed at 2 in 2018-19, 3d VRC Talindert S., L.
Red Hot Dane. 2 wins at 1200m, 1400m, 2d ATC Australian Turf Club 2YO H., TAB Highway H., 3d ATC Canterbury Park 2YO H.
Taskmaster. 3 wins to 1450m to 2017-18 in Aust. HAPPY GIGGLE (Rory's Jester). 4 wins at 2, A$274,250, VRC Maribyrnong P., Gr.2, VATC Blue Diamond Prelude (c&g), Gr.3, VRC Maribyrnong Trial S., L, VATC Merson Cooper S., L. Sire. Happy Spring (Rory's Jester). 2 wins. See above. SEASIDE (Redoute's Choice). 4 wins-1 at 2-to 1400m, A$300,710, Scone RC Dark Jewel Classic, Gr.3, ATC Hyland Race Colours H., Bowermans Office Furniture 2YO H., MVRC LF Sign Group H. Producer. ONLY SHE CAN (Marju). 3 wins from 1000m to 1800m, R161,690, Fairview Lady's Bracelet H., L. Producer. CHANTSKI (War Chant). 4 wins at 2, A$309,800, WATC Gimcrack S., Gr.3, Westspeed 2YO P.-3 times, 2d WATC Supremacy S., L, Westspeed 3YO P.